Matt ‘The Immortal’ Brown has been one of MMA’s all-time most exciting fighters to watch. Thus making the day that he finally decided to hang up the gloves all the more sad for MMA fans. However, Brown’s retirement wouldn’t last forever as just a matter of months after his last bout with Diego Sanchez, Brown would be paired up with fellow fan favorite Carlos Condit in a dream bout that many had been wanting to see for several years. Unfortunately, Brown would suffer a torn ACL in preparation for the fight, therefore, putting a halt to his comeback plans. Now at age 38, the Ohio native still hopes to make a return and he has someone in mind. 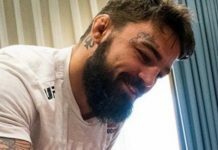 “Who gotta be in the ring wit me to get y’all to buy #PayPerView lol or just who equals the best or most entertaining match up for what you think my skill set might do well against and or not well against 路‍♂️” Mike Perry recently tweeted. “Hoping I’m ready by June or July. I’m down” Brown responded. 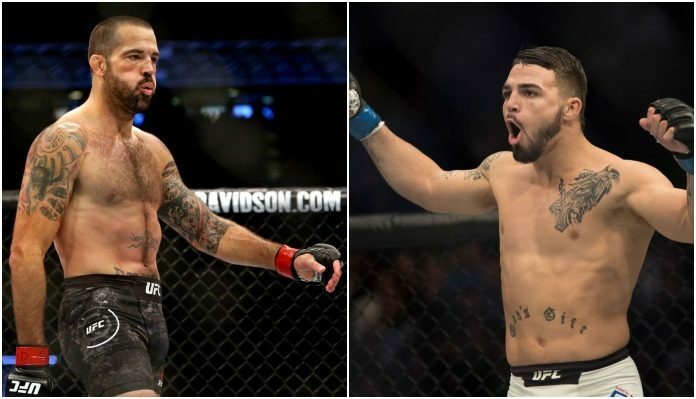 Stylistically, Mike Perry vs Matt Brown has all the potential to be a good ol’ violence filled war at 170-pounds. For Perry, his most recent outing came against another veteran in Donald ‘Cowboy’ Cerrone who ended up besting Perry via first-round submission (armbar) at UFC Denver. The loss made Perry 1-3 in his last four fights so he will surely be motivated to pick up a W in his next time out no matter who that ends up being against. Despite no response from Perry to Brown just yet, it would be rather surprising if ‘Platinum’ was to say no to Brown… Or anyone for that matter.